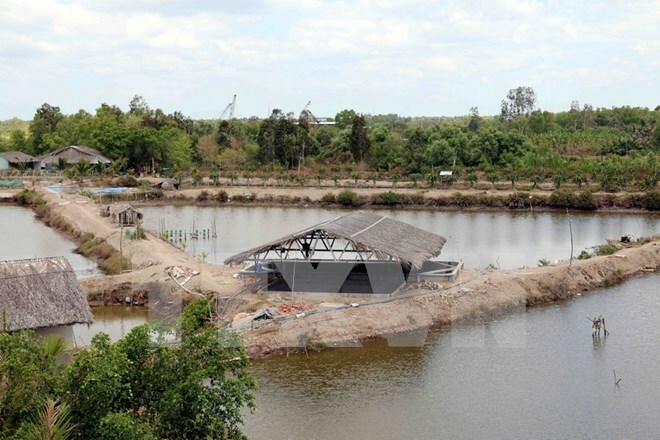 Ca Mau (VNA) – More than 52,400 hectares of shrimp in the southernmost province of Ca Mau were damaged by the recent prolonged drought and saltwater intrusion. The natural disasters occurred from February 1 to May 15, 2016, Chairman of the provincial People’s Committee Nguyen Tien Hai said on May 26. The districts worst affected were Thoi Binh, U Minh, Phu Tan, and Cai Nuoc, according the provincial Department of Agriculture and Rural Development. Many hectares of fish and shellfish were also ruined. Total economic loss due to El Nino amounted to over 260 billion VND (11.7 million USD). Chairman Hai said the province will support aquatic breeders in resuming production by providing them with breeding varieties.